Small Business Group Health Insurance Simplified. budget, all in one place..
With energy deregulation, businesses are now free to shop for their Energy(natural gas)supply on a competitive basis. As an Energy broker we shop your local market for the lowest cost energy supplier for your business. There is no cost or fee for this service. Your local utility still will service and bill your business, you just get a lower energy rate and a lower monthly cost. There is no obligation after you receive our quotes. But in almost all cases you can lower your monthly energy bills by 10 to 15% with no change in billing or service. Please contact us for your free no obligation quotes. Your business must be serviced by National Grid/Keyspan or Con Edison Please complete an authorization form and fax it to 631-656-2512, please include a copy of your recent energy bill. We will give you a quote within 48 hours. 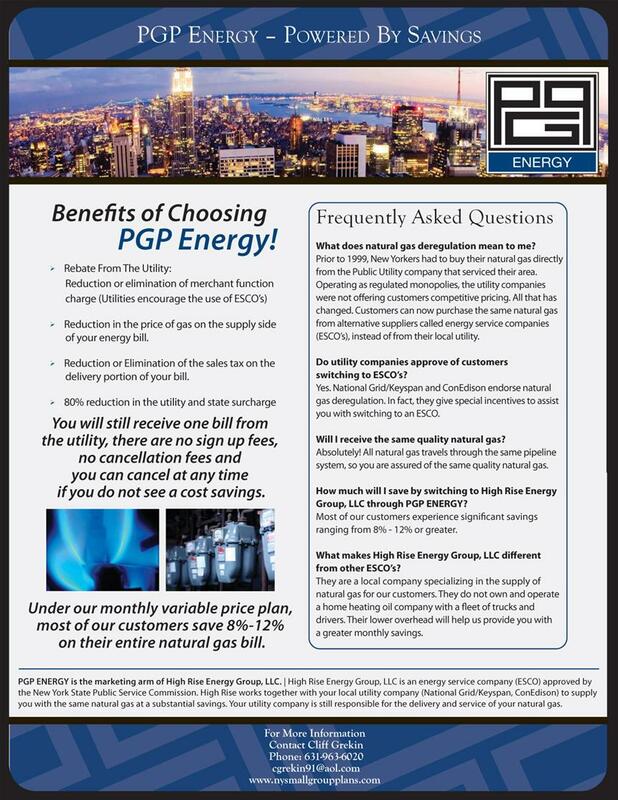 If your business is located in NY state(excluding Long Island), NJ, Ct, PA, MD, RI, NH, TX, VA, VT and CA visit PGP Electric to lower your businesses electric bill. Stay in touch with the latest events, news and offers that we have.